Today (January 27) China announced the allocation of 1.039 billion yuan ($157 million U.S. 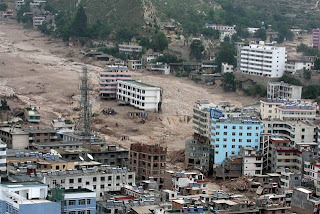 Dollars) to areas hit by natural disasters in 2010. This is in addition to 4.1 billion yuan ($617 million U.S. dollars) allocated in November to help the survivors of the disasters get through the winter. 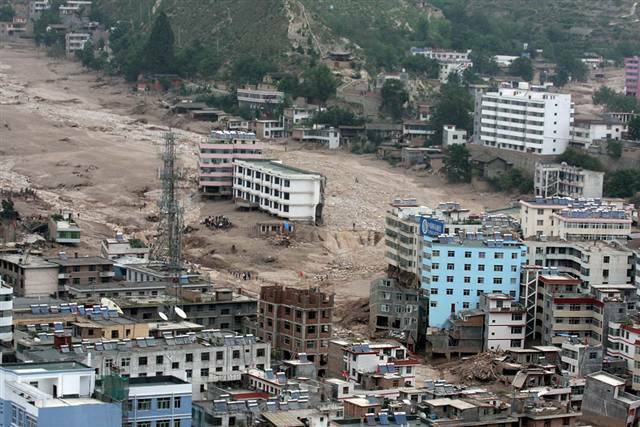 A magnitude 7.1 earthquake hit Yushu killing 2200 people, and a mudslide in Zhouqu left 1700 people dead or missing. There are good posts on the mudslides and floods on Dave Petley's Landslide blog. It has been estimated by the Disaster Emergency Management in China that natural disasters affect 200 million people every year, and that they are one restricting factor on social and economic development (reference here). These are typically floods and associated landslides, earthquakes and famines. The deadliest flood, and possibly deadliest natural disaster, of all times were the 1931 floods in China, with estimated deaths ranging from 2,000,000 to 4,000,000. The 1976 Tangshan earthquake killed between 242,419-779,000 people (I love the number of significant figures in that statistic! ).